Backsplash tiles can be expensive, as well as difficult to install, which is why peel and stick tiles are an attractive option for many. When you're considering renovating your kitchen, sometimes adding a peel and stick backsplash can make a significant impact to your kitchen decor with a minimal amount of time and money. What Is a Peel and Stick Backsplash? Peel and stick tiles are plastic or vinyl tiles that mimic the look of ceramic, glass and stone. They can be applied directly to the dry wall on your kitchen backsplash, between the counter and the cabinets, for an easy, protective and decorative wall covering. Because their adhesive is already on the backs of the tile, no special glues or tools are required to install them; just peel off the backing and press them to apply. Smart Tiles - These tiles look like glass or ceramic tiles, but are extremely lightweight, cut with scissors and install in minutes. Stick and Go - Stick and Go tiles resemble ceramic tiles, complete with built in grout lines. 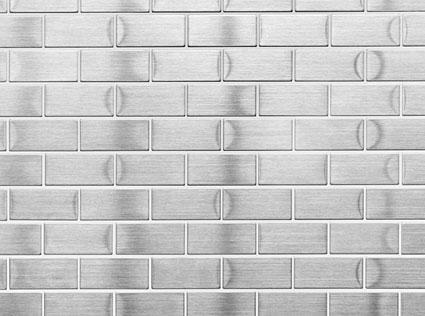 Aspect Metal Tiles - These lightweight tiles are made of 60% recycled metal materials, but peel and stick to any surface. Should You Choose Peel and Stick Tiles? The installation of an actual tile backsplash requires much more wall preparation than self-adhesive tiles do. When you apply tile, you need to sand down the painted wall to roughen the surface, then apply mastic with a trowel prior to applying the tiles. However, in the case of stick-on tiles, very little preparation is required and the tiles are far less expensive. Additionally, the ease of application makes it possible for any homeowner to complete the project in a single weekend without hiring a professional installer. Tiles with self-adhesive backing are not difficult to install on the wall above your countertops, but there is some preparation required. By following the steps below, you'll increase your chances of a perfect, problem-free backsplash installation. Purchase or order samples of any colors or patterns you are considering and look at them in your kitchen ahead of time. Once you decide on the exact color shades you would like in your tile pattern, take measurements and create a full template of each wall out of craft paper. Make sure to incorporate the size of the tiles into the design and determine how many tiles you'll need to cut. With your new template, you'll know about how many tiles you need for your wall, but also take note of the electrical plugs and switches along the wall that you'll need to replace. Consider replacing all plug and switch plates for an even more dramatic effect to your kitchen decor. If the new tiles are thicker than 1/4-inch, purchase outlet extender boxes as well. These will ensure you can screw on your switch plates over the new tiles. Each type of peel and stick tile will have its own installation instructions. Some can be cut with scissors, while others will require a vinyl tile cutter, rentable at any home improvement store. The following are basic instructions that can be used for most brands. When in doubt, always consult the manufacturer. Using a damp rag, wash down the wall to remove all trace of dirt, dust or other particles. Allow the wall to thoroughly dry; otherwise the adhesive will not work properly. Make sure no trace of water is present when you start. Transfer your template onto the wall with chalk and a level. Lay your template on the floor and place all of the tiles onto your template in the color pattern that you've planned. Make note of the tiles that run over the edge of the template. These are the tiles you'll need to cut to fit. Each time you are ready to apply a tile, remove the backing and, as you apply it to the wall, hold a straight edge along one line and use it as a guide to place one edge of the tile so that it won't slip and attaches evenly. Cut all outlet holes carefully with a utility knife or scissors, but don't worry about small mistakes because the plate will cover them. Applying a peel and stick backsplash is one of the easiest ways to improve the appearance of your kitchen. No matter which type of tile you choose, you're sure to enhance the look of your kitchen in just one weekend.